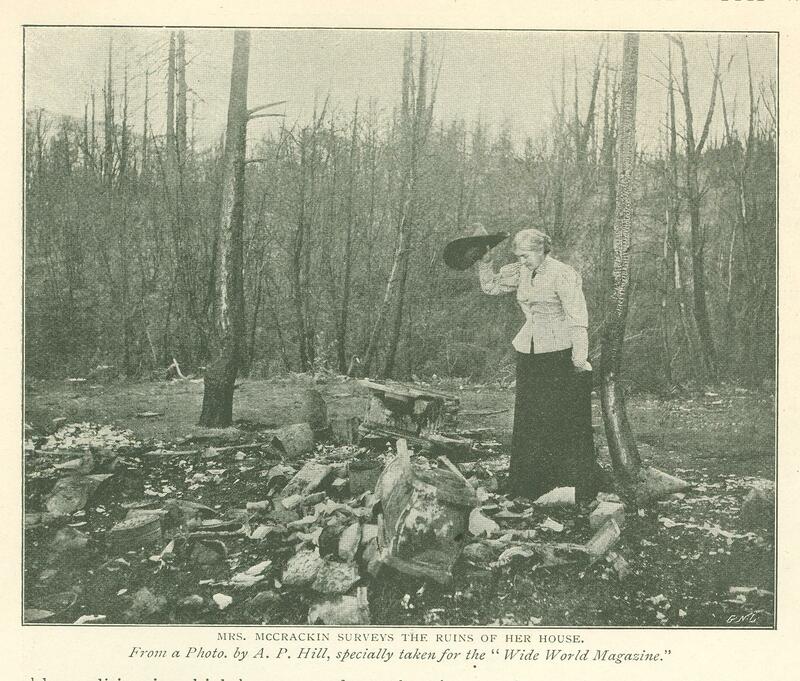 The fire which swept over the Santa Cruz Mountains on October 8th, 1899, was especially destructive, and to reduce it to sub­jection the entire mountain community came to the front. Many acts of heroism 'were per­formed, for information regarding which the writer is indebted to Mrs. Josephine Clifford McCrackin, a Californian author, who was entirely burnt out and upon whose vineyard grew some of the grapes whose juice later on did good service in saving the Meyer winery. I am also indebted to Mr. E. E. Meyer. The section of the Santa Cruz Mountains herein described over­looks the Santa Clara Valley, and is one of the richest in the entire State, as well as being the most beautiful. Only a few years ago it was virgin forest whose attractions were accidentally observed by a former German naval officer, Mr. E. E. Meyer, who decided to settle there. At that time the slopes were a mass of redwoods, firs, and madrones; and the location selected by Mr. Meyer was one of the most attractive in the whole range, abounding in deep and well wooded canyons, and provided with a fine water supply. Mr. Meyer is a leader in his community, and is highly esteemed and honored in Santa Clara County; and the heroic fight he made in the great fire, not only for his own home but also for those of others, shows that their belief in his pluck and valor was not misplaced. In fact, if the truth is told, this section of the State seems made up of men and women of remark­able qualities, in which bravery and true heroism appear to predominate. It was after great diffi­culty that Mr. Meyer established his winery, and then he spent years in waiting for the grapes to grow to maturity. Finally, however, success was assured. Many others followed his example. Mrs. McCrackin, the lady already re­ferred to, in a letter to the writer says: "I remember well the enthusiasm with which we drank the first product of the little hand-press, and how proud we were of the first 5,000 gallons of wine which Mr. Meyer made. The hand-press was thrown aside after the first season, and ma­chinery, which I cannot describe except as 'new­fangled,' but of which Mr. Meyer is able, not only to name, but also to construct every bolt, wheel, and rivet, now fills the vast halls and engine-room of the winery. His own wine output has now reached nearly 100,000 gallons, and every season his acreage be­comes larger, and some new im­provement is introduced in the working ma­chinery." Mr. Meyer named his winery the Mare Vista, and today it is one of the best­ known in all America. His wine finds its way all over the civilized world. About 500 ft. from the winery Mr. Meyer built his home, and reach­ing away from it are beautiful grounds. Up to October 8th one of the grandest California hedged the place in. The drives to the house were through natural groves of trees centuries old; groups of laurel, ma­drones, and firs telling the story of the prodi­gality of nature in this country. The winery is a large, two storied building, with large trees growing to within 100 ft. of it. Here was all the valuable machinery, representing quite a large fortune, together with thousands of gallons of wine in all stages of age and development. This wine, however, was des­tined, not indeed to be bottled and sent East, but to be forced upon the flames of a terrific forest fire! The fire, it was believed, was deliberately caused on the other side of the mountain by some irresponsible and even criminal individual, who merely wished to burn some brush. A high wind, however, blew the flames forward, and in a short time a vast area was a raging sea of fire. The moment it was seen that it was going to threaten life and property the men of the mountains turned out en masse. Some of them were on horseback, others in teams, with all the appliances at hand for fighting fire on a large scale. The men hurried to the threatened ranches. At two o'clock in the morning Mr. Meyer and his son were battling with the flames on the adjoining ranch of the McCrackins, and also on Dr. Goldmann's place; but the flames swept over the fifty acre timber tract, destroying the trees, burning the ranch house and forest cottage at the McCrackin estate, and driving the little band of fighters before them. 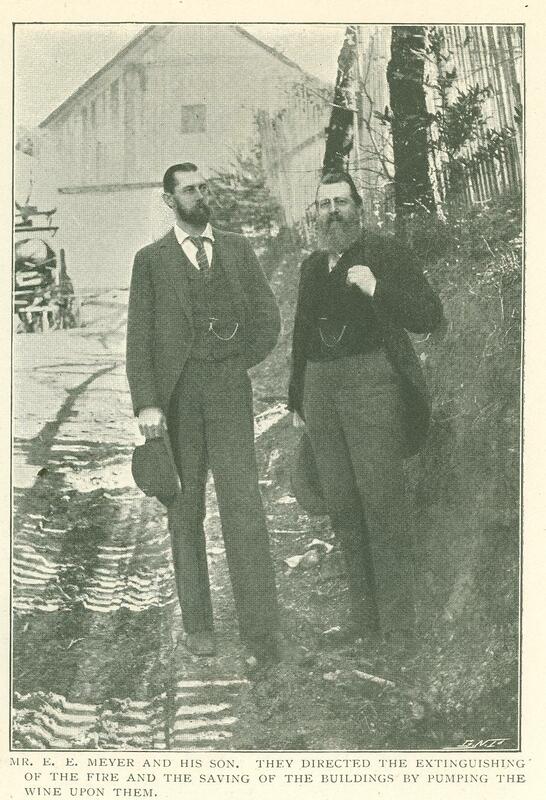 It was now seen that the Meyer house was threatened, and the weary men accord­ingly turned their attention to it. They had been fighting fire on the Goldmann place, and had been driven back on the McCrac­kin ranch. The fire at three o'clock in the morning was destroying the ranch house, and running down to lick up fifty acres of timber - land before six. So it may be imagined that the band of workers were well nigh ex­hausted before they turned their attention to the Meyer place. Mrs. McCrackin, who, almost surrounded by fire, was a witness to all the scenes described, says: "How utterly exhausted the men were after performing almost incredible feats of bravery it is impossible to say in words; only those who passed through such a furnace of blinding fire and stifling smoke can possibly understand and appreciate their condition." The writer regrets that all the brave men who formed the little army beaten back by the advancing wall of flame cannot be mentioned. There were at least fifty, not to speak of women and children. They had seen tens of thousands of dollars in valuable vineyards go up in smoke during the night, and had witnessed priceless trees centuries old drop before the invader. They had likewise watched orchards worth thousands, which had been years in maturing, melt away like thin air. Among these heroes were Frank and Louis Matty, sons of Mr. A. Matty, who was among the wealthiest land­owners in the vicinity. These gentlemen loaded all their wagons with tools and implements which might be of service in fighting the fire, and started to assist their friends and neighbors. With them were Messrs. Robert Borella, George Robishott, James Feely, Albert :Morrell, Fred Smith, and Pow King, together with Messrs. McKinney, Humferville, Montgomery, Wilson, Shane, Hoops, and other ranchers who are shown in the accompanying photograph. These brought with them the Frenchmen working on their vineyards - M. Patin and others. "There were also men from Alma, ten miles to the west of us," said Mrs. McCrackin; "besides men from Soquel, ten miles to the south of us, who had left these water was their own places to help beat back the common enemy." The roar of the flames was now so loud that men could not make themselves heard a yard or two away. The heavens were illuminated, and vast columns of smoke rose so high that they were seen fifty miles distant. There was not a fire engine for a great number of miles around, and no appliances for fighting flames except the ­small hose used at the ranch. The men began to. fear that the women would soon be surrounded, while the latter were in an agony of fear lest their husbands, brothers, and friends should fall victims to the waves of flames that seemed to come roaring on in every direction, licking up the trees. And the trees falling added to the horrors of the scene. The battle at Mare Vista was under the leadership of Mr. Meyer and his son, and no force was ever led with better strategy. A few men happened to be on the ground when the fire swept upon the ranch. Ying, the Chinese cook, proved himself possessed of no little forethought. Without orders he had collected all the vessels which would hold water, and at once an amateur fire brigade was formed, composed of the heroic wife of the owner and some guests. The grounds were literally mined with water pipes, and from passed in buckets by the little brigade, who devoted their energies to wetting the verdure. and ground, and trying to keep the flames from a ravine filled with trees, near at hand, which wound around the wine-cellars. A fierce wind was now blowing, and the flames shot into the canyon like a fiery serpent and ate their way through it with incredible velocity. In a few minutes the building was surrounded with a crescent of fire. The sight at this time was altogether terrible. Great tongues of flame shot into the air, envelop­ing large trees and setting them ablaze at once. It was almost impossible to face the conflagration, and those who did had narrow escapes from death. The winery was evidently doomed. Trees blazing from top to bottom had plunged across the gulch, bridging it with flame, and the building was threatened on every side. Mr. Meyer had long before this placed men at the water hose, of which there were two, and for some time this seemed successful, and the men kept the fire away from. the main building, although facing a fiery furnace in the effort. But a new danger soon became apparent. On the west was a small canyon, into which the flames were seen eating their way with resistless force. They came on with a roar, licking up the largest trees, encircling and devouring groups of beautiful madrones, giant oaks cen­turies old, and then sped on in the direction of the house itself, following the driveway. The house was surrounded, but saved by the fire fighters, partly by the heroism of Mr. Frank Matty and others, who crawled through the brush, up the Soquel Creek Canyon, and with a bucket brigade fought off the flames. This done, the Chinese cook and his assistants ran to the winery, which was now threatened with destruction, the wind blowing a gale from the north. It was about noon, and many of the men had been battling with the fire from the early hours of the previous morning, and were therefore nearly exhausted. The sun was red in the sky, and seemed to add to the terrors of the situation by its burning heat. Men faltered and almost lost their reason, and the deeds accomplished by every fir~-fighter in the little moun­tain brigade if witnessed in a city would have made each man a famous and much­ chronicled hero. While the fire was at its worst Mrs. Meyer, fearing for her husband and son, ap­proached the spot as near as she could to call them away. She found Mr. Meyer and Albert Morrell fighting the fire literally in a seething pit of pumice, into which the flames had found their way below the winery. They were directing a stream into the red hot vat, while above them, in a window surrounded by flame, stood Emil Meyer, making it possible for them to work by turning a second stream of water on their own persons. It was said after­wards that had the young man faltered or been driven back the others would have been roasted alive. The situation at this time was highly exciting and dra­matic. Men were rushing from point to point, some falling ex­hausted, whilst others were screaming orders which could be only faintly heard above the roar of the flames. Sud­denly a fierce gust sent a cloud of embers upon the roof of the scale ­house, and in a moment the cu­pola burst into a blaze. A shout gave the warning. There was no ladder at hand, but one of the men, named George Roeshot, who had fallen from the blazing McCrackin cot­tage early in the morning, made a running leap for the roof, and finally, after almost fatally injuring himself, he succeeded in keeping his hold. He then crawled slowly upward, facing the intense heat, and smothered the blaze with water soaked blankets which were sent up to him. Small buildings and outhouses now began to catch fire from the terrible heat, and the men took their axes and tore down whatever they could. They were engaged in this when a cry of warning came. The pall like cloud, which had hung over the north end of the winery buildings, suddenly blew aside, and they saw the gasoline house smoking. In it were stored about one hundred gallons of gasoline, which, if it exploded, might as well have been dyna­mite, as it would have destroyed every person in the vicinity. Emil Meyer was on the top of the winery roof, facing sure death if the house caught, and shouts of warning were given which rose above the roar of the flame. At first he did not understand what was meant, but finally learned that the key of the gasoline house was wanted, and he alone knew where it was. There was not a moment to lose. He could not come down quick enough, and so he shouted a message to the Chinese cook, who quickly produced the key. 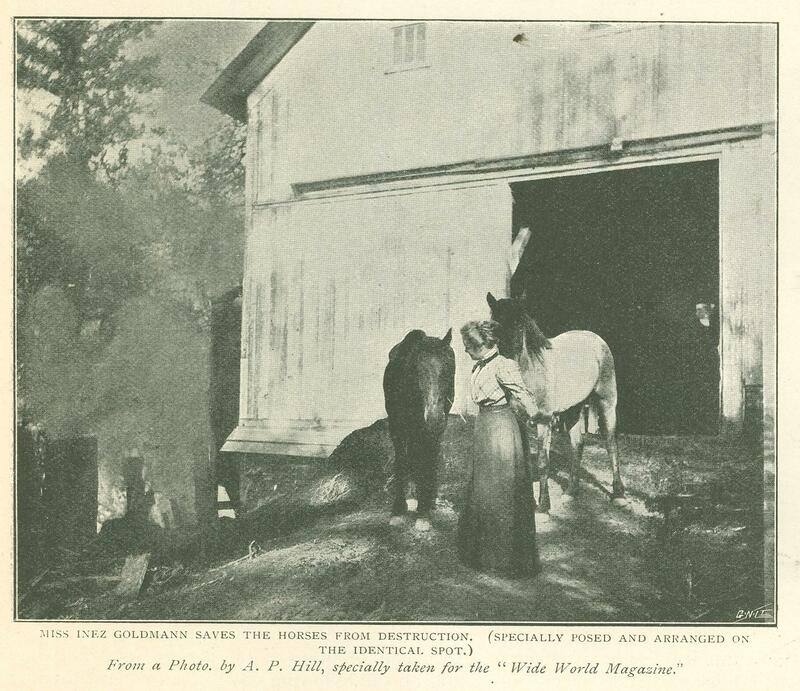 It was necessary to break the connecting pipe between the gasoline house and the winery, and Albert Morrell climbed up to the engine floor and attempted to break it, but failed. Emil Meyer heard his call and swung himself down. Then, single handed, he broke off an iron pipe which, it was said later, two men could not have bent under ordinary circumstances. This and the fact that they had reached the roof of the gasoline house and had broken the connection enabled them to stop the fire there. But the end was not yet, and a new danger threatened. which all but took even their courage away, and resulted in the final effort with wine as a fire­ extinguisher! The fine old trees of the estate were falling in every direction, when suddenly the wind began to drive the flames in the direction of those trees which surrounded the water tank, from which the men were obtaining their supply. The trees about this tank were so large that Mr. Meyer believed that they would actually resist the flames. But nothing could stand before this whirlwind of fire. A huge fir caught, blazed upward like a gigantic rocket, struggled vainly for a short time, and then fell with a terrible roar directly upon the tank, crushing in its side, breaking or choking the pipe, and stopping the supply flow of water. It was impossible to go near the spot, and hope nearly fled from the brave band. They faced the disaster a few seconds in utter dismay. Men with buckets and hose; men singed and blistered; men ready and willing to work, but suddenly deprived of water, while the flames, like living things, came creeping ever onward. It was now that the resources-the genius­ of Mr. Meyer as a fire fighter were displayed. Attaching the hose unhesitatingly to the big wine vats, he shouted, " Man the wine-pumps!" The flames were almost licking the western wall; the heat was so intense from the sur­rounding blazing trees that the building was a fire in several places, and simultaneously flames burst from the top of the roof near the ventilators. Also from the tower of the open storehouse, and two places on the side; while another blaze appeared at a corner of the building. It was like spontaneous combustion. The very air seemed on fire. But the men soon had a hose on the wine vat near the southwest door, and, with a shout, manned the pump, while another gang manned a second pump, and the hose was run out upon the roof. There were now one hose of water and two of claret. It was a sight to make Bacchus shed tears - this seeming waste of ruby red glorious wine that was played upon the devouring flames. What would the effect be? Probably not one man there had ever heard of wine being used in this way. And yet Dr. Goldmann, the physician of the vicinity, knew that wine exposed to heat would produce carbonic acid, which would smother fire. Besides, Mr. Meyer knew the same thing, and it did not take him a moment to decide whether he should or should not pump his valuable wine on the mighty conflagration. The result was altogether remarkable. The wine seemed to kill the flames or smother them down. Merrily rang the clank of the pumps; and by tapping vat after vat, and pumping no less than four thousand gallons of wine, the flames. on the winery were finally subdued, and by noon this extraordinary victory was won. In a communication to the writer Mr. Meyer stated that part of the wine used was young­ hardly through fermentation, in fact; and it contained about 1 per cent of sugar and was still warm. It was pumped through a Jin.hose; these are facts which will probably interest those to whom wine as a fire extinguisher is a total novelty. The men now devoted themselves to fighting the fire away from the house; and it was soon evident that there was actual danger to life. Some of the heroes of the wine hose were miss­ing; the terrible ordeal had been too much for them. Since two o'clock in the morning every man had been fighting fire, with no food and no rest. Emil Meyer fell fainting across the threshold of his home, and it was found that his clothes were literally burnt from his body. George Roeshott was unable to reach the house, and was found lying senseless in the yard. Frank Matty shouted that his brother had been overtaken by the fire; and a brave band of volunteers started in search of him. He was found lying exhausted where he had fallen, badly burnt, but still alive. If the men performed prodigies of valor, what shall be said of the women who lived in these beautiful homes? They too did their share in fighting the flames. One instance of remarkable pluck deserves particular attention­ that of Miss Inez Goldmann, the sixteen year­ old daughter of the doctor. Before daybreak the flames were eating their way about her home; and from a point of vantage she could see that the Meyer estate was threatened. She also saw the flames approaching the stable in which were six valuable horses, and knowing that all the men were fighting fire on her father's and the McCrackin estates, she determined to make the attempt to save them herself. Alone, and unaided, she started through the brush, which here and there was smoking and blazing. She plunged through thickets where she was liable to be cut off by the fire, and at last she reached the stable. With the roar of flames high above her on the mountains sounding in her ears, she rushed into the stable and led out the terrified animals. Miss Goldmann then took them to a place of safety, while the flames were yet crackling and roaring about the big trees which surrounded her. She had rescued all the horses, and was dragging out the harness, when she saw that the fire had been driven around, and was now menacing her own unprotected and beautiful home - the "Villa Bergstett." So rapidly did the fire run up the ravines, that on attempting to beat a retreat she found herself completely surrounded by a river of flame. But help was coming; the fire fighters were now marching on to the Meyer estate, and at the stable they found the fair heroine standing guard by the valuable property she had saved. All that night the little band patrolled the place, taking turns in sleeping, as the mountains were still burning, and, of course, the workers never knew when the wind might shift and blow the flames back again. Fortunately there were other reservoirs near the house which were full, and from these water was taken with which to fight the flying embers, which were still a grave danger. For three or four whole days the demon of fire swept on, carrying away everything before it, and eating a portion of the very heart out of the famous Santa Cruz Mountains. The interesting illustrations which accompany this article were specially prepared for THE WIDE WORLD MAGAZINE at considerable expense and trouble. They were taken by the American artist and portrait painter, A. P. Hill, who has a studio at San Jose, and who made several trips into the Santa Cruz Mountains during and after the fire. 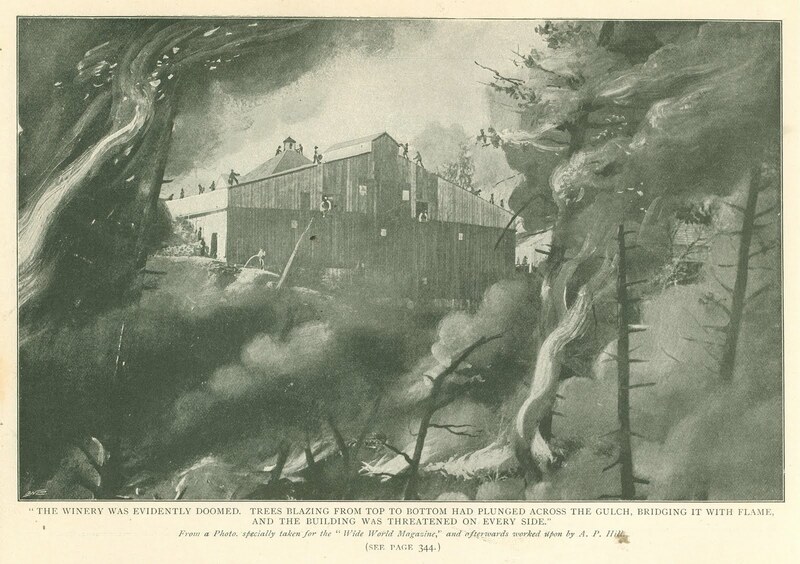 In a letter to the writer he gives an idea of how rapidly the enormous redwood trees, 200 ft. high, were destroyed. He says: "One night I watched the fire creeping along the ridge near the summit of Lorna Prieta. Presently it entered a thickly wooded place on the mountain, composed of pine, redwood, spruce, and fir. Some of the redwood trees were about 200 ft. in height. I could see a great blaze at the base of the trees that seemed like a furnace. Then, one after the other, they were simply enveloped from base to tip with flame, which leaped upwards with a velocity so great that it seemed unable to stop when it reached the top of the tree. Then, with one great bound, it continued, leaving tree and earth far behind, and exploding high in mid-air, lighting up the country for miles around." Mr. Hill was on the foothills with his bicycle and camera when suddenly he found that the atmosphere was thick with smoke. He says: " I realized that the forest fire in the Santa Cruz mountains, which we had noticed, the night before, had now assumed rather alarming pro­portions. That night people walked to the western outskirts of the town to view the grand spectacle of miles of blazing fire above them; and on the following day the smoke had become so dense in the valley that the outlines of houses and trees could hardly be discerned only one block distant. That night the fire had spread so extensively that single large trees could be distinguished, as the blaze seemed to shoot up the trunk and rapidly spread through all the branches. The following morning I decided to take the early train to Santa Cruz and step off at Wright's, high up in the mountains, where I had many friends, and could perhaps be of some help. The conductor told me that precautionary measures had been taken in case the fire should at any place or time .cross the track or attack one of the tunnels of the railroad. He also said that a force of thirty men had been on the train the day before, and this day, Saturday, fifty men had been taken on at San Jose. I was further told that so far the fire had not crossed the Los Gatos River, and for that reason, when we reached Wright's, I found a far clearer atmosphere than we had in San Jose, lying to the north of this celebrated mountain trout stream.
" As none of my friends were at the station I mounted my wheel and proceeded leisurely to climb farther up by slow degrees. The day was sultry unusually so for an October day; but when I came within sight of Lorna Prieta I saw volumes of smoke rolling out towards the valley from a fire that was running riot on the south slope of what is called the Cattermole Ridge, or North Ridge. And although I knew that there were miles between it and me, I did not like the gusts of hot air which a fitful breeze wafted in my direc­tion, and I was glad to think there were miles of land and a stream of water between that great fire and myself. It was pleasant, too, to think of the cool, shady veranda, with a breath of fresh air from Monterey Bay, which would greet me at my friend Meyer's place; and I felt not at all unfriendly toward the huge casks and vats of his winery, where I knew wine-making was going on, and where I expected to drink deeply of the new pressed must, which some people, with degenerate taste, I own, prefer to the wine proper. "For days after the great fire had died down the sturdy youngsters who live in these moun­tains could go out and catch by hand foxes, quail, wild cats, and jack rabbits, whose feet were so burned from the ashes and coals that they could not run away from their pursuers; and where the fire had swept along the road the carcasses and corpses of wood rats, foxes, and cottontail rab­bits were found bestrewing it, with half charred birds of all kinds among them. "That was the great fire of whose near ap­proach there was no thought on the night of Saturday, the 7th of October, and which, fanned through the night by a sudden terrific gale from the north, had destroyed many homes before midday on Sun­day, and which will long be remembered by spectators and participants, as well as the sufferers themselves, to whom, in many cases, there remained absolutely nothing save the ruins of the old home amid the devastated forests, orchards, and vineyards." Originally published in The Wide World Magazine. July 1900.